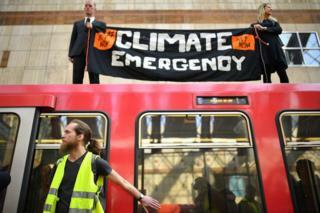 Climate change protesters climbed on top of a train at Canary Wharf station in London, and glued themselves to the carriage. They were later removed from the carriage, along with another man who glued his hand to the train window. Thousands of protesters are demonstrating against climate change across the world today. Protests are taking place in 80 cities, in more than 33 countries. 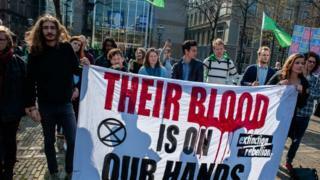 The group says it plans to continue throughout the week and wants to "bring London to a standstill" until the government takes 'urgent action to tackle climate change'. The London mayor Sadiq Khan says he is "extremely concerned" about more action. 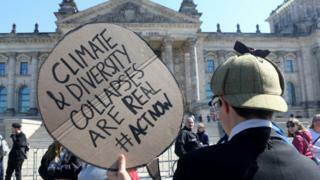 Activists held a climate change demonstration in front of the Reichstag, the main government building in the capital. Their aim is to combat climate change by disrupting people's daily lives, including attempting to stop city traffic. Buckets of fake blood were poured on the street right next to government offices. The protestors say that every second that is wasted by politicians is more blood on the government's hands. The group was launched last year and since then its members have forced bridges and roads to close, and even poured buckets of fake blood outside Downing Street. 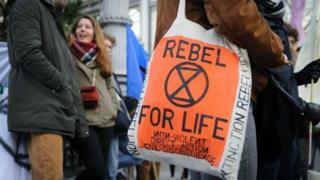 As part of Extinction Rebellion's protests the group has been trying to get arrested as much as possible because they think it will help with their demands. Some people say, however, that the group causes unnecessary disruption and wastes police time when forces are already overstretched.